Convenient central location in a peaceful area of the city originally built for artists homes and studios. Surrounded by green areas next to a garden of art displays. Ideal place for relaxation, walks minutes away from the Mjodd buscentral and shopping area. As short drive from from Smaralind the largest shopping and leisure centre in the Reykjavik area. Connecting roads to major travel directions. 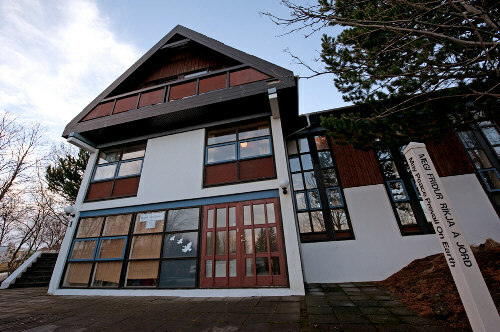 The Reykjavik Peace Center Ambassador Club House (Orlofshus Fridar 2000) is operated by the Peace 2000 Iceland society (Fridur 2000 Island) for accommodating Peace Ambassadors and peace loving people from all over the world. If you are not already a member of the Peace Ambassador Club we will be happy to grant you a free complimentary introductory membership. During your visit to the Reykjavik Peace Center you will have the opportunity to upgrade your membership and receive a decorative letter of credence of your appointment as an Icelandic Peace Ambassador.